Optoma knows that going wireless is something that many people would love to have and enjoy these days, and the NuForce BE2 wireless headphones is their exact response as to how a pair of wireless headphones should be. In fact, Optoma bucks the trend that insists on how superior sound quality is accompanied by a superior price point with the NuForce BE2. This pair of wireless Bluetooth in-ear headphones is touted to be the most affordable option yet in the BE family of premium Bluetooth, in-ear headphones, where it does not break the $50 price point, clearly making this a prime candidate for an impulse purchase for shoppers. Available in both black and white shades, the NuForce BE2 is certainly a pair of wireless headphones that packs quite a punch, hitting far above its own weight category. It is also sweat proof, making it ideal for you to wear whenever you would like to sweat it out in the gym or pound the pavement. With a 10 hour battery life and AAC audio compatibility, making it the only model at this price point to offer the latter. 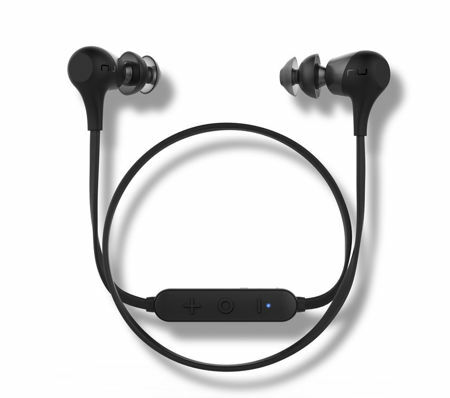 The NuForce BE2 is one unique addition to the market that delivers a seamless wireless audio experience without having to break the bank. Knowing that people tend to get a bit careless with their hardware when they travel, Optoma has ensured that the NuForce BE2 has been made to be durable in nature. The accompanying functional design has been crafted using polycarbonate and is equipped with Kevlar reinforced cables, delivering a lightweight, sturdy form factor. Apart from that, the wireless in-ear headphones will boast of magnetic earpieces, which in turn enables tangle-free listening and portability. It will also boast of SpinFit TwinBlade ear tips that have been specially designed to deliver an optimal fit and comfort, being made from high quality silicone to offer superior stability and improved noise isolation.